Geometry curves representation. We represent a 3D shape (right) to a set of planar curves (right), called geometry curves, whose interior lines (shown in yellow) correspond to the feature lines of the surface and the boundary line (shown in red) corresponds to the boundary or fundamental polygon of the surface. The feature lines of geometry curves record the mean curvatures of the 3D shape in both sides which encode the geometry information of the shape. Geometry curves are vectorized forms for 3D shapes which can be used in many applications such as compression, modeling, and editing. 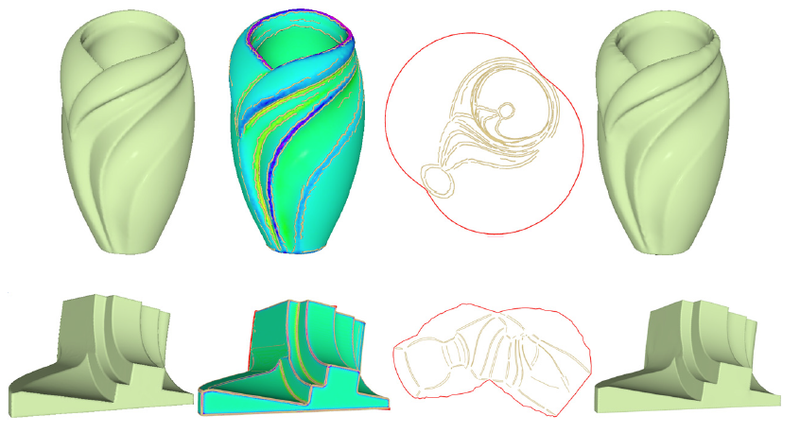 We propose a novel compact surface representation, namely geometry curves, which record the essence of shape geometry and topology. The geometry curves mainly contain two parts: the interior and boundary lines. The interior lines, which correspond to the feature lines, record the geometry information of the 3D shapes; the boundary lines, which correspond to the boundary or fundamental polygons, record the topology information of the 3D shapes. As a vector representation, geometry curves can depict highly complex geometry details. The concept of geometry curves can be utilized in many potential applications, e.g., mesh compression, shape modeling and editing, animation, and level of details. Furthermore, we develop a procedure for automatically constructing geometry curves which obtain an excellent approximation to the original mesh. Motivation Our work was partially inspired from the following two works. The work of "geometry image" represents a 3D shape into a 2D bitmap image. The work of "diffusion curves" represents a smooth shaded image into a set of curves where the curves encode the color and gradients of the image. We combined the two ideas and represent a 3D shape as a set of curves and developed a new form of vector representation of a 3D shape, called "geometry curves". X. Gu, S. Gortler, H. Hoppe. Geometry images. ACM Transactions on Graphics (Proc. SIGGRAPH), 21(3), 355-361, 2002. A. Orzan, A. Bousseau, H. Winnemöller, P. Barla, J. Thollot, D. Salesin. Diffusion curves: a vector representation for smooth-shaded images. ACM Transactions on Graphics (Proc. SIGGRAPH), 27(3), 92:1-8, 2008. Recovering the surface from geometry curves. (Left to right) Starting from geometry curves, we employ the constrained Delaunay triangulation method to construct the mesh connectivity. After that we diffuse the mean curvature from geometry curves and reconstruct the surface by Poisson equation. The color bar on the right side represents the mean curvature value. More examples of geometry curves. The below example is the Fandisk model with sharp features. The red lines on surfaces are cut edges. Thanks to the reviewers for their constructive comments. Thanks also to Andy Xia for the video voice recording, Shen Yu, Kun Liu, Haibin Huang and Stephen Giguere for helpful discussions. This work is supported by the National Natural Science Foundation of China (61070071, 61222206) and the National Basic Research Program of China (2011CB302400).